If you want a trailer for serious off roading, then our 2015 Cub Explorer will go everywhere your car will take you. It comes with a stainless steel roll-out kitchen complete with storage drawer, sink with manual hand pump to 80L of on board water. There’s a Primus portable 2 burner gas stove, 1 gas bottle, fridge box with slide that’s suitable for a 50L Evakool Fridge/Freezer or similar (Fridge not included in sale). There’s a deluxe awning, complete with 13 poles that can be erected in less than 15 minutes, that measures 1.7m x 4.0m. 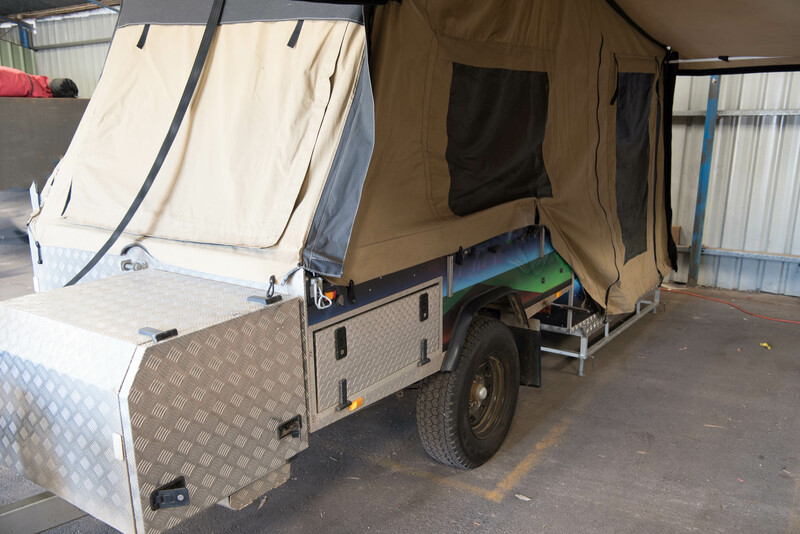 Inside the trailer there’s a lift up double bed with plenty of under bed storage, that also houses the included 105AH AGM Battery, 240V Projecta Charger and Redarc BDCD1225 Solar Charger. It also has 240V and 12V Merit power outlets. The Explorer uses a Trigg Off Road hitch, has 15″ all terrain tyres with plenty of tread. On the drawer bar, there’s a jerry can holder, a tool box AND wood box. It can be towed by all 4WD vehicles with a minimum 90kg ball weight capability. This trailer is actually light brown in colour – underneath our business colours – that will be removed prior to hand over. Trailer has been used as a hire trailer and has been serviced regularly at Cub’s workshop in North Rocks.